Literary icon Can Themba (widely known as writer for DRUM magazine) is remembered through Khayelihle Dom Gumede’s presentation of Themba’s Crepuscule. Gumede is the third 2012 winner of the Theatre Arts Admin Collective’s Emerging Theatre Director’s Bursary. 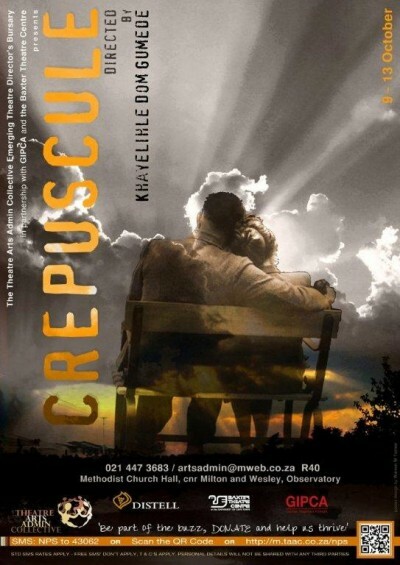 Crepuscule is an adaptation of literary giant Can Themba’s short story of the same title. The play, much like the short story, charters a fictional interpretation of a real life love affair between Can and a white woman, ‘Janet’, in Sophiatown during the 1950’s. Set in the often revered and romanticised world of Sophiatown, the play uses Can and Janet’s relationship to ask whether we are products of our environment or if we choose who we want to be. A story about human connection and a search for freedom and humanity, this production is an ensemble-based treat; with poetry of language, movement and song forming its rich presentation. In the tradition of several recent revivals such as Farber’s Mies Julie and Kerfoot’s Statements after an Arrest under the Immorality Act; this high energy, fast-paced production takes a look at a time much closer to who and where we are today, than we would like to admit. Khayelihle Dom Gumede recently completed a BA in Dramatic Arts at Wits University, majoring in Directing, Performance and Writing. His directing credits include The Complete Works (2010), Can Themba's Crepuscule (2011/2012), the main production of the Highfield Theatre Festival, When We are Naked (2011), Finding Nemorena (2012), Tilt (due to premier at PopArt in 2012), Paul Slabolepszy's Over the Hill (2012) Gumede is the Festival Director and Co-ordinator of the WALE (Wits Art and Literature Experience) Festival 2012, as well as the curator and Festival Director of ‘Sneak Peeks Festival: The Jozi G-Town Experience’ at PopArt. Gumede is also the Artistic Director of Co-Lab Express, a new, young theatre company operating in association with UJ Arts Centre. He has written productions for Ipelegeng . 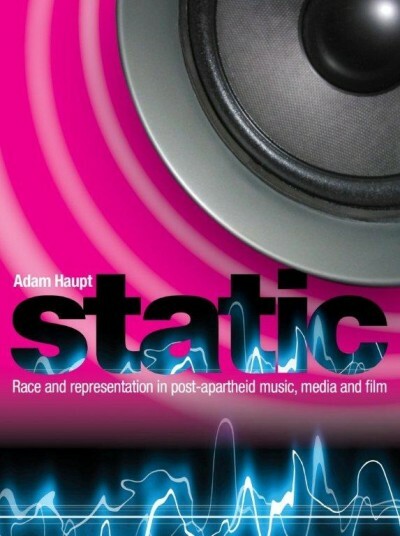 . .
Prof Adam Haupt discusses the Fanonian resonances in his new book Static: Race and Representation in Post-Apartheid Music, Media and Filmas part of the Gordon Institute for Performing and Creative Arts (GIPCA) Great Texts/Big Questions public lecture series on Thursday 4 October. Cutting across academic disciplines, the creative arts and the media, Haupt's interdisciplinary book forms the basis of his presentation; which critically examines music, cinema, social media and the politics of change after apartheid. Static explores some of the ambiguities of life in contemporary South Africa, providing key insights into recent media phenomena, such as Die Antwoord; the 2010 Soccer World Cup; Bok van Blerk; Tsotsi; Kuli Roberts’ Sunday World column on ‘coloureds’; revisionist film Afrikaaps; the University of the Free State’s Reitz video scandal; umShini Wami and The Spear. Playing with two different definitions of the term 'static', it poses two central questions: Is South Africa changing for the better, or are we static? Is there too much static for us to hear each other clearly? Haupt investigates the notion of creative and political agency in South Africa after apartheid, contending that although it is possible for a newer generation of South African artists to move beyond the confines of apartheid racial thinking, the challenges of the past have not all dissipated. By examining racial and gender politics in work by a range of artists, it would appear the legacy of a patriarchal, racialised system lingers on. Moreover, Haupt explains, South Africa’s neoliberal economic policies have perpetuated an order that protects uneven access to (cultural) resources. It is arguable that not much has changed for marginalized artists in South Africa, given the persistence of media monopolies, racialised class disparities and attitudes towards race. 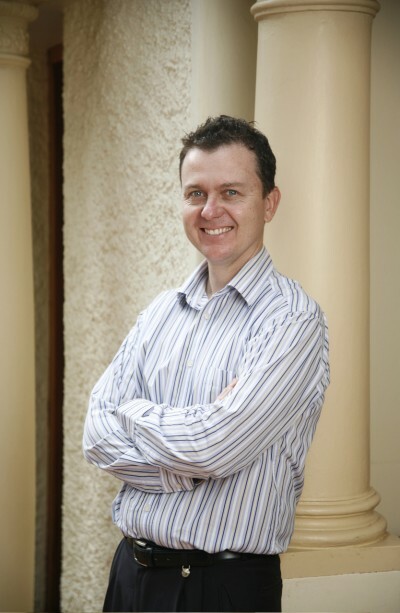 Adam Haupt is an Associate Professor in the Centre for Film and Media Studies at the University of Cape Town. Haupt is the . . . Experts in many and varied disciplines gather to explore climate change at the Hot Water Symposium, hosted by the Gordon Institute of Performing and Creative Arts (GIPCA) in association with the African Climate and Development Initiative (ACDI) on 28 and 29 September 2012. 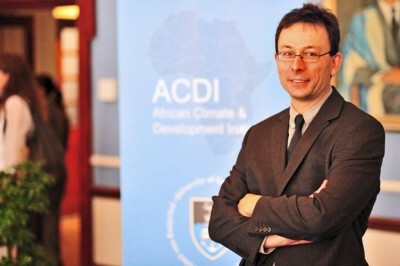 Keynote speaker Professor Mark New is the Pro Vice-Chancellor and Director of the African Climate and Development Initiative (ACDI), University of Cape Town. Professor New acts on behalf of the Vice-Chancellor's office to provide enhanced academic leadership around the strategic goal of addressing the climate and development challenges of Africa from an African perspective, and he takes the lead in facilitating and substantially extending climate research at UCT, as well as continuing his own research. He holds a joint appointment as Professor of Climate Science at the School of Geography and Environment, University of Oxfo rd. Completing his Honours studies at UCT, New went on to receive an MPhil in Environment and Development, and a PhD in Geography (Climate Change and Hydrology) from Cambridge University. Over the last 12 years, he was involved in two outstanding Masters programmes at Oxford University's School of Geography and Environment: as a lecturer on the MSc in Environmental Change and Management, which has a strong climate change science and policy focus; and as Academic Director of the MSc in Water Science, Policy and Management. New has a wide range of experience and professional training in communicating with stakeholders who range from lay public, through to media organisations, NGOs, industry and government agency professionals and government departments, and his international reputation and track record has attracted sign ificant external funding for large research programmes. His research and consulting expertise in climate change, especially with respect to development in Africa, spans key interlinked areas of climate science: climate monitoring, climate modeling, impacts . . .
A great deal has been said about cloud computing – although companies still have a limited understanding of what it is and how it impacts their business. Simply put, the cloud is a set of services and technologies that enable the delivery of computing services over the Internet in real-time, allowing end-users instant access to data and applications from any device with Internet access. “It is generally accepted that there are three different types of cloud: public, hybrid and private. 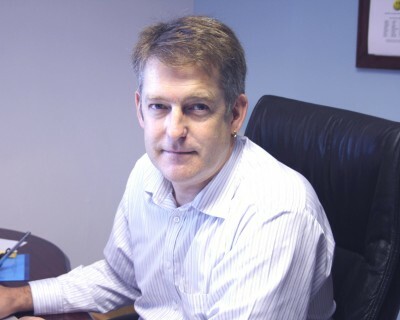 This has several implications, particularly when it comes to implementing PBX systems in your organisation where the need for security and cost effectiveness is crucial,” says Rob Lith, Director of Connection Telecom. As you move towards a cloud-based PBX system, a question you will need to consider is which option would work best for you: Public Cloud Public cloud applications exist in off-site data centres owned by a service provider. In our experience, a large number of smaller customers, representing a comparatively small number of extensions, favour public solutions. The benefits to your business are that it is easy and economical to set-up; it is flexible and scalable and you only pay for what you use. The main pitfall being that you are completely reliant on your service provider. Private Cloud Private cloud solutions remain in customer-owned data centres, hosted by the customer or the service provider, on- or off-site. Large companies prefer private cloud because it allows them to leverage their considerable investments in high-end network and data resources and equipment, thus retaining control over the running and support of their deployments. The private cloud option takes costly and time-consuming installations, but it provides a sense of security and control. Hybrid Cloud Hybrid implementations reside in customer-owned data centres, and calls are carried out over a virtual private network via a public switch. Hybrid installations are used by a small but . . .
Should your company move to the cloud? “Cloud-based communications has clear benefits, but whether those benefits will accrue to your organisation depends on a number of factors,” says Rob Lith, Director of Connection Telecom. “If your enterprise answers to any of the questions in the checklist below, you may be in the market for a hosted PBX.” Are you likely to expand? Entities with significant potential for branch-like expansion – such as a medium-to-large-footprint bank, a retail chain or a service station franchise – can derive the most value from cloud telephony. Every time a new branch of franchisee comes on-line, the expense of an on-site PBX has real potential to sink the business case. With cloud, the franchisor or corporate head office can offer hosted telephony into the bargain, significantly lowering the entry barrier for local businesses. In addition, this model of telephony is much easier to roll out and manage for uptime, and the “on-net” savings possible with cloud further lift the business case. * Are your employees mobile? Is a significant portion of your workforce mobile, either by virtue of being constantly on the road or remotely stationed? A cloud communications configuration can provide satellite working units with full enterprise collaboration and unified communications at low cost. Even user administration tasks can easily be done via Web portal, from any operating platform (device). Do you need flexible communications capacity? Cloud computing operates on a “virtualised” design principle, where physical separations between resources like disk drives or servers are irrelevant – all the computing power represented by these resources are pooled together in an amorphous “cloud” of divisible capacity. In such a scenario, you’re not bound by the limitations or excess capacity of discrete servers; you can simply procure just enough virtual capacity for your use in any given month (or shorter time increments). This makes sense for campaign call centres or varying seasonal . . .
by Tim James, director of sustainableIT The Carbon Disclosure Project (CDP) is a global initiative encouraging big business to report their carbon footprint and water usage and the steps that they are taking to reduce it. It was introduced to South Africa in 2007 and has recently also been extended to cities. This year, CDP has requested climate change information from the 100 largest South African companies by market capitalization, based on the FTSE JSE All Share Index. Although companies are not yet obliged to disclose their carbon emissions, some experts believe they may soon be required to do so. “There is no obligation yet for businesses to report their emissions,” says Tim James, director of sustainableIT. “However, this situation is changing rapidly internationally and locally, the government has indicated that it will introduce carbon taxation in the 2013/14 budget. What this means exactly is unknown - but it is clear that as least some businesses will be required by law to report and disclose their footprints in the short term.” Whether it is obligatory or not, James says that there are a number of business benefits to calculating your carbon emissions. “The main benefits would include identifying emissions sources – which can then reveal reduction opportunities. Reducing emissions often lead to reduced costs, which is important in the tough economic times we find ourselves in. It is also important to understand your carbon profile and hence your risk exposure when emissions taxation and/or emissions caps are introduced.” James believes there are intangible benefits to green business as well. “Improved staff morale and marketing and public relations benefits are but a few,” he states, although he believes that companies will only demonstrate a real commitment to environmental awareness once they see the improvements thereof reflected in their bottom line. “There is also no doubt that in geographies where legislation has been passed to support . . .
Sub Saharan distributor of Progress Software, AIGS, has announced that they will be launching the Corticon Business Rules Management System in October 2012. Corticon enables organisations to make better, faster decisions by automating business rules and is used by over 450 customers to automate their most complex decisions processes – reducing development and change cycles by 90%. “Corticon empowers organisations to improve productivity and customer service through its agility, allowing businesses in volatile markets to adapt quickly to changing market conditions,” says Premie Naicker, Chief Operating Officer of AIGS. “What makes the product particularly powerful though is that it empowers businesses to manage the rules themselves – even complex algorithms – which eliminates the typical IT bottleneck. It’s particularly well-suited to industries that have a vast number of processes and products.” The event will include the presentation of both local and international case studies, an interactive live demonstration and an examination of both complex and simple rules. The event will start at 08.30 on the 18th October. Those wishing to attend can register on www.aigs.co.za or contact claudiab@aigs.co.za for further information. More Info: http://www.aigs.co.za Author: Estelle Nagel from DUO Marketing. Originally distributed by MyPR.co.za. No of Images Uploaded: None To gain access to None image/s please Like, Tweet or +1 this article: . 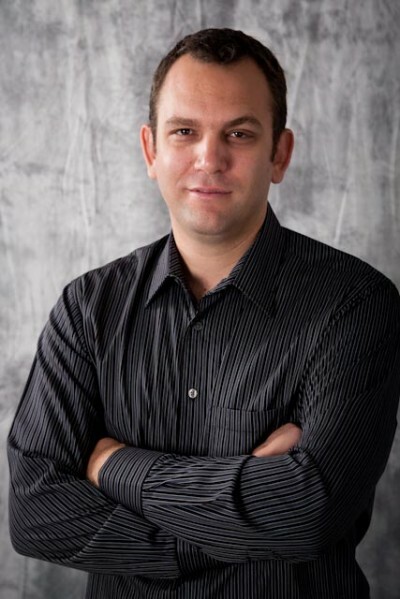 . .
BY WESLEY LYNCH, CEO, REALMDIGITAL The remarkable mainstream success of mobile devices – specifically tablets – opens up immense opportunities in education. If embraced by schools, they can overcome the expense and impracticality of desktop-bound computer hardware, lessen the premium on software and significantly raise the value of technology-aided education. Proven and affordable As demonstrated with the recent text book delivery crisis in Limpopo, access to information is a key obstacle to raising education standards in South Africa. Undeniably, information access is a less immediately pressing issue than access to water, good roads or land ownership. But perhaps government policy makers can be swayed by the fact that tablets are more affordable than is widely known. iPads are admittedly not the best solution for state schools, but there are Android alternatives that cost half the price of Apple’s models, and must therefore be considered candidates for a government-subsidised distribution model. In schools that don’t qualify for subsidies, due to a legacy of privilege, another possibility is for learners to bring their own tablets to school. These can be integrated into the school’s network and custom app ‘store’. Private ownership is already becoming more attainable – some cellular contracts offer a tablet along with a handset, at a low premium. But, even these mechanisms still leave tablets out of reach for many poor sections of society, and state subsidies would be stretched to spread the tablet effect far and wide. However, there is evidence to suggest tablets with pre-loaded content are more cost-effective than sourcing print course material. But the greatest news of all is that for approximately R1000, schools can buy an Android experience that compares satisfactorily to higher-end models. Major benefits Once the acquisition is made, the educational benefits of tablets quickly become evident. Low-cost, quick content Among the . . .
One of South Africa’s quietest tech success stories is a seven-person business that’s gone from startup to profitability in just four years – without ever marketing itself or taking a cent of outside financing. In the process, mobile social network 2go has come to dominate the Nigerian market, where it has over nine million active users – several million more than Facebook. The secret, says director Peter Lockhart, has been balancing a tight focus on what 2go’s users really want – a cheap, easy way to chat and socialise using their mobile phones – with the deep technical expertise needed to deliver that experience across thousands of different devices. “Building mobile technology for an African market is tough,” says Lockhart. “Data and SMS are expensive, and our users are price sensitive and savvy. That means we have to deliver an application that uses the absolute minimum of system resources and bandwidth. Our response has been to develop proprietary communications protocols and compression algorithms that minimise the app’s data usage.” The 2go team has also cracked the technical challenge of producing an app that works equally well on all of the myriad feature phones that still dominate the African market. “It’s much, much harder to develop for feature phones than for smartphones,” says Lockhart, “partly because there is such a variety of platforms and operating systems. You need deep technical knowledge. This technical knowledge also extends to our ability to scale the back-end in a very resource efficient manner.” The fact that 2go works well on many handsets has been critical to the viral spread of the app, says Lockhart, adding “feature phones aren’t going away any time soon. Projections from Informa indicate that non-smart phones will still comprise 85% of the African handset market in 2015.” 2go has resisted the tempation to bloat its app with added features, adds Lockhart. “Our users log in and out quickly, several times a day – they want . . .
Kimberley in the Northern Cape is preparing for an epic skateboarding battle when ten teams from cities and towns across South Africa battle it out in the Maloof All-City Contest on Thursday, 27 September from 11h00 to 16h00, at the Maloof Skate Plaza. To date, teams from Kuruman, Kimberley, Pretoria, Cape Town, Bloemfontein, Jeffreys Bay and Johannesburg have entered the contest, which will see each team member compete in a head-to-head format on various sections and obstacles at the state-of-the-art state park. Top local skateboarders will be seen in action as the four-man teams compete for the total prize money of R14 000. According to Tim McFerran of Maloof Skateboarding, the All-City Contest is a new, unique and innovative twist to skateboarding and is being tried for the first time in Kimberley. “We have always wanted to do all-cities, team-oriented contest, where strategy and co-operation will play an important role. I believe that the growth of skateboarding and the vastly improved skills of the South Africans present a great opportunity to start it right here in South Africa. This will be a fun, yet competitive way to ascertain which city has the best skateboarders in South Africa. Some of our top pro skateboarders from the States will help judge the contest and I am sure we are going to see super-exciting skateboarding,” states McFerran. The Maloof All-City Contest will be a scene setter for the greatest skateboarding event in the world, the Maloof Money Cup skateboarding world championships, which will take place at the Maloof Skate Plaza in Kimberley from 28 – 30 September 2012. The who’s who of street and vert skateboarders will be descending on the province in an attempt to take the biggest prize purse in skateboarding history. The winning city will hold the Maloof All-City title until the next Maloof championship event in 2013. The Maloof Money Cup South Africa is presented by Kumba Iron Ore and is a joint initiative between the Northern . . .